Ovens can be a nightmare to clean, especially if they haven’t been cleaned for some time. If a build-up of grease, fat and grime occurs on your oven interior, then not only does it look and smell unpleasant, but the oven is rendered unhygienic – definitely not something you want to be cooking food in. With this in mind, When was the last time you cleaned your oven? With this in mind,Absolute Shine cleaning Services are giving you some tips on keeping your oven clean. If you don’t feel like doing it yourself, then we have cleaners in your area who are ready and waiting to make your oven sparkle like new. Just head over to our booking page where you can arrange an appointment for a cleaner. You may be thinking ‘this is a strange oven cleaning tip’. 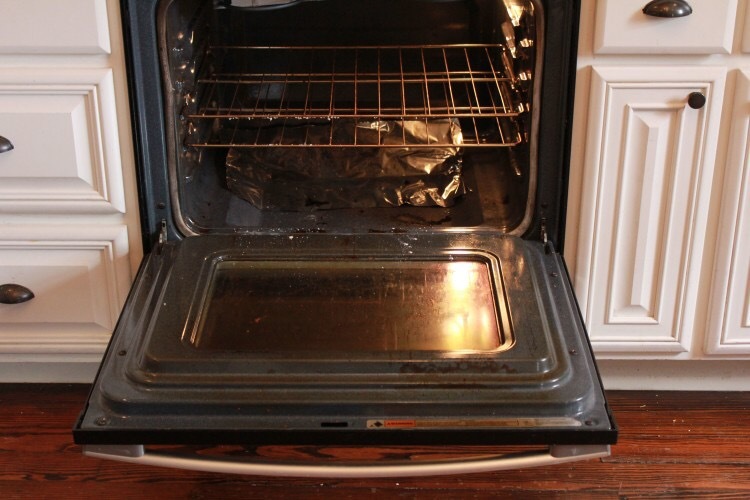 However, many people, when cleaning the oven, don’t remove the metal shelving that sits inside. This reduces access to the oven interior, which means you are unable to clean it properly. A great tip is to remove the racks, coat them in oven cleaner, and then place them in a bin-bag while you clean the rest of the oven. You’ll find they come out looking as good as new! This might seem pretty obvious, but old burnt chips and pieces of toast-crust can often hide themselves in the corners and down the sides of your oven, and they love disappearing to the back to burn even more! Prior to cleaning the oven walls, you should first remove all this debris so that you can apply your cleaning solution to the actual grime, not loose pieces of old food that you can remove easily. With the racks out of the way and soaking, you can get to work on the oven interior. This might look like a pretty dreadful job to get stuck into, but you’ll be glad you did it. Take whatever cleaning product you’re using – be that a shop-bought specific oven cleaner, or your own baking soda solution – and coat the inside of the oven with it. Then you need to leave the solution to work its magic, so put the kettle on and have relax while your cleaning solution does the hard work! Obviously, after your cleaning solution has done the hard work for you, the only thing left to do is to remove the grime that was coating the inside of your oven. Make sure you wear gloves for this as it not only gets messy, but if you have used a shop-bought cleaning product then they are often corrosive and can burn your skin. OK, we know everyone likes to think they have time to do EVERYTHING around the home. But busy lives mean we can’t always keep up with the housework. If your oven is in need of cleaning, then our cleaners are ready and waiting to make them spotlessly clean. Just book an appointment now and find out for yourself!are giving you some tips on keeping your oven clean. If you don’t feel like doing it yourself, then we have cleaners in your area who are ready and waiting to make your oven sparkle like new. Just head over to our booking page where you can arrange an appointment for a cleaner.